Rivalling the Orient Express We boarded train 263# at 9:10pm for a 24+ hour trip across the Mongolian-Russian border, bound for Ulaan Ude. We had half hoped for the luxury of a cabin to ourselves but were also looking forward to a more genuine idea as to what travelling on the train is like… and we certainly got genuine! The first little bit of excitement came from the missionary who was actively recruiting for Jesus in a very loud and patronising manner next door. I’m not sure if I was more excited or pre-emptively angry about the prospect of an attempted conversion while stuck in a small space on the way to Siberia. Nothing was to come of this however we were in for a bit more excitement and entertainment from our seemingly meek and unassuming cabin mate. She was a small lady of Mongolian or Buryat descent who looked to be in her mid thirties. She was very quiet but friendly and tried to help us out regarding what to expect regarding the timing of border crossings etc. She did seem to mention customs a overly much. I didn’t think too much of this until she began removing felt clothing items from her three overstuffed bags and started rolling them up to slip into the sleeves of her jacket, inside shoes and blankets etc. She disappeared into another cabin quite quickly and we mused over having a small time smuggler in our cabin before settling down to sleep. ‘Small time’ may have been an underestimation of sorts. The next morning the Provodnitsa brought another lady to the cabin and indicated, by gesture mostly, that we should move one of our bags off of the spare bunk because another lady (who had been in another cabin over night) would be moving in. What was not communicated here was that for all intents and purposes, it was not the lady herself that was moving in but her stash of illegal imports. What followed next, and in the hours leading up to the search by Russian customs at the border, was an incredibly flurry of middle aged ladies moving felt clothes, shoes, pants, knitted goods and blankets around and spreading them out throughout the train. Apart from stowing bags and packages of goods; pants, hats and scarves were, not so surreptitiously, hung over every spare rail in our cabin (including the ones on our beds). We each acquired a temporary pair of boots by our beds, as ours were stowed away under the seat, and, just before customs stepped onto the train, our cabin mates arranged themselves as casually as they could sitting atop a small pile of things. Once customs had checked our cabin and moved on, there was a chain of ladies passing things down the train (while the customs officers backs were turned) at which point our newest roomie would stow them into nooks and crannies in our cabin that had already been checked. It turned out that apart from us, the missionary and a couple of blokes down the far end, everyone in our carriage, including the attendants were in on it. We were to learn later that groups of ladies will make these trips everyday smuggling over huge quantities of goods and hiding as much as they can in order to avoid paying duty on it. How not to become a Hungry Demon… In the Buddhist tradition, the hungry demons inhabit one of the six worlds; gods, semi-gods, humans, animals, hell (both hot and cold), and the world of the hungry demons. The hungry demons have enormous bellies and very small throats, they also breathe fire, effectively char grilling everything they try to eat. They are unable to satiate their appetites. Ulaan Ude, in the Russian province of Buryatia, has a population of just under half a million people and its most famous claim to fame is a 15 metre tall, 70 tonne statue of Lenin’s head which presides over the town’s main square. 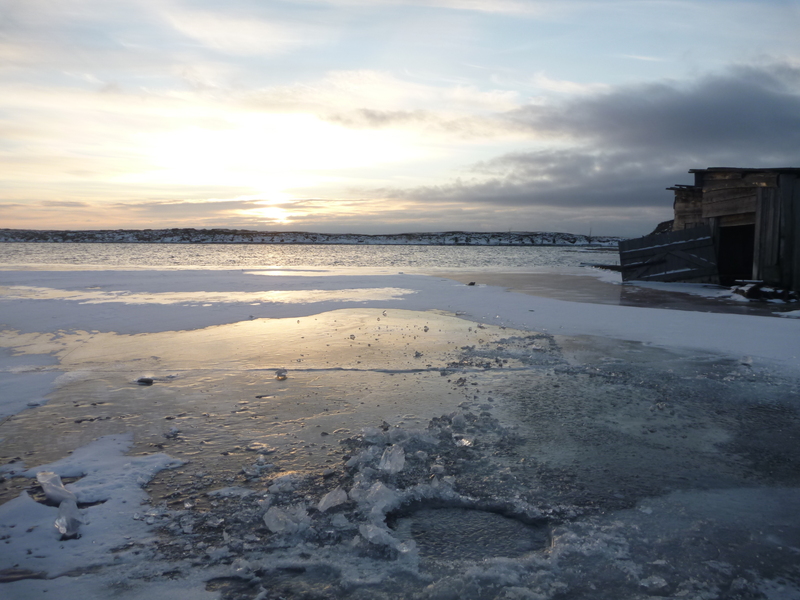 The city sits between two tributaries of Lake Baikal, the Ude and Selenga rivers (both currently, spectacularly frozen). 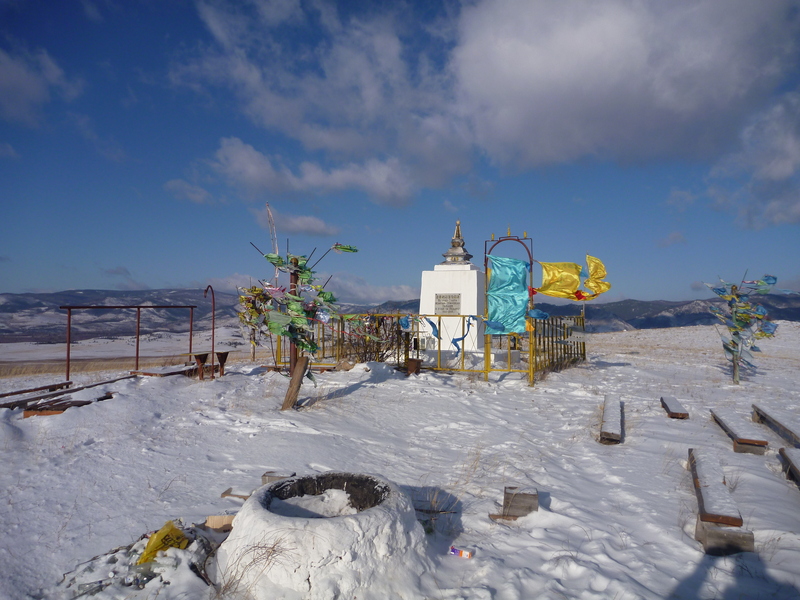 The Buryat region is also home to a sizeable Buddhist population and houses several Buddhist temple complexes or Datsans. We spent a good part of our two days in Ulaan Ude visiting the Ivolginski Datsan and the Atsagatski Datsans where we were instructed in Buddhist philosophy and iconography. We were told that the most desirable of the six worlds to be born into is that of humans because we have the most agency over our actions and destiny, and as such, the most chance of reaching Nirvana through the human world. During our time at the Datsans, our guide shared many stories that instructed us how best to generate positive karma in order to ensure that we are human again in our next life and do not end up in hell, or as a terrifying and starving, hungry demon. Aside from generating good karma, I think the second way to avoid becoming a hungry demon is much simpler… live in Russia. We have been stuffed full to the brim at every meal we’ve had since arriving in Russia, starting with a “light” midnight supper when we arrived at our homestay; potato dumplings, sliced meat and cheese, garlic & cheese topped tomato/eggplant rounds, cucumber, bread, sour cream, fruit compote, and tea. No matter how big your tummy and small your throat, Russian hospitality will see you happily bloated and ready for a lay down after every meal. Despite the fact that the word vegetarian is usually met with the same look as if you’ve told your host that you just tracked mud across their carpet, all our generous hosts have risen to the distasteful challenge of preparing incredible, meat free food. The Old Believers The most exciting meal we’ve had to date was as guests of three Babushkas in the Old Believers’ village on the outskirts of Ulaan Ude. The Old Believers are people who resisted reforms to Russian Orthodoxy and hold to traditional practices. The village is comprised entirely of traditional wooden houses that are painted in bright colours. It is here that we learned that a traditional Russian meal served with vodka (homemade in this case) will involve no less than three toasts. I made the mistake of emptying my glass after the third to discover that this was an absolute bare minimum and was obliged, in the interests of being a good guest, to indulge in 2 or 3 more full toasts. After lunch, our hosts sang traditional Buryat songs for us which was incredibly touching. They also dressed us up in traditional costumes… we are fairly sure that they also tried to marry us without our consent. The overnight train to Irkutsk was on the whole uneventful and we arrived at 8:00am the next day (in total darkness). From there our lovely guide Lena and driver Igor, drove us two hours out to the edge of Lake Baikal where we were hosted in the traditional fishing village of Bolshoe Goloustnoe. Known as the ‘Blue Eye of Siberia’, Lake Baikal spans over 600km and is approximately 1637 metres deep. Amongst the endless number of statistics and trivia facts that accompany a lake of this size is the fact that it holds 20% of the world’s fresh water and that the lake could, by itself, supply the entire planet with clean drinking water for 40 years. I have had a long standing fascination with this area having read several adventure travel accounts of explorers who have kayak and boated along the tributaries in the Baikal region. I certainly can’t do the area justice but I strongly recommend the following if you are not sure what to read next; Barbed Wire & Babushkas or Five Months in a Leaky Boat. Our time in Bolshoe Goloustnoe was spent taking lazy walks around the lake and village area, eating (of course), and indulging in traditional Russian banya (sauna and bath house) sans the beating with birch twigs. And then…We are currently in Irkutsk getting ready for our biggest stint on the train which will start tomorrow evening – 53 hours from Irkutsk to Ekaterinburg. This entry was posted in Matryoshka, White Christmas and Reindeer Burgers, Travel and tagged Irkutsk, Lake Baikal, Russia, Ulan Ude. Bookmark the permalink. Can’t think of anything worse than spending 53 hours on a train. Even I can’t sleep that long in a vehicle, and I am renown for sleeping at lot in cars and planes. And as for your uncle, the men in white coats would be needed.